Background: Rap1 and Rap2 belong to the Ras subfamily of small GTPases and are activated by a wide variety of stimuli through integrins, receptor tyrosine kinases (RTKs), G-protein coupled receptors (GPCR), death domain associated receptors (DD-R) and ion channels (1,2). Like other small GTPases, Rap activity is stimulated by guanine nucleotide exchange factors (GEF) and inactivated by GTPase activating proteins (GAP). 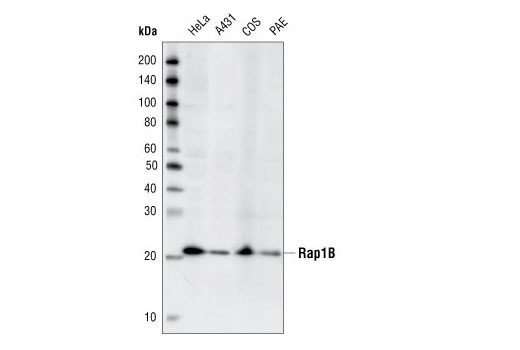 A wide variety of Rap GEFs have been identified: C3G connects Rap1 with RTKs through adaptor proteins such as Crk, Epacs (or cAMP-GEFs) transmit signals from cAMP, and CD-GEFs (or CalDAG-GEFs) convey signals from either or both Ca2+ and DAG (1). 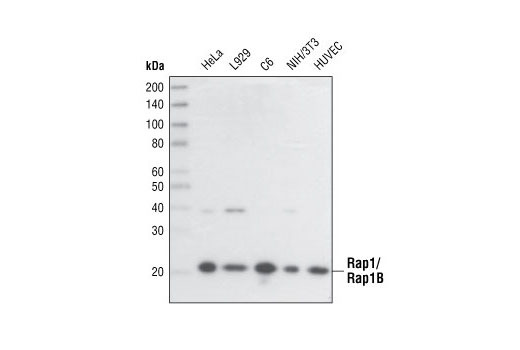 Rap1 primarily regulates multiple integrin-dependent processes such as morphogenesis, cell-cell adhesion, hematopoiesis, leukocyte migration and tumor invasion (1,2). 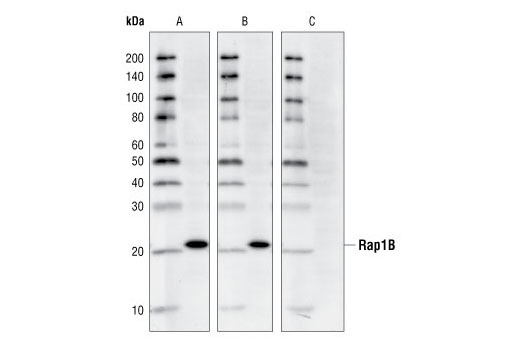 Rap1 may also regulate proliferation, differentiation and survival through downstream effectors including B-Raf, PI3K, RalGEF and phospholipases (PLCs) (1-4). Rap1 and Rap2 are not fuctionally redundant as they perform overlapping but distinct functions (5). 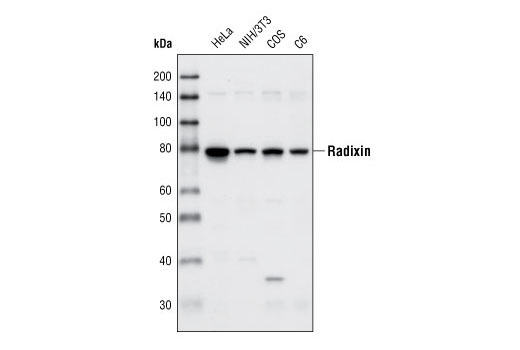 Recent research indicates that Rap2 regulates Dsh subcellular localization and is required for Wnt signaling in early development (6). Background: EPAC1 and EPAC2 (exchange proteins activated by cyclic AMP) are guanine nucleotide exchange factors (GEFs) that catalyze the exchange of GDP for GTP, activating Rap1 and Rap2 small GTPases. Rap activation by EPAC is cAMP-dependent and mediates cAMP signaling in part through protein kinase A (PKA) (reviewed in 1). 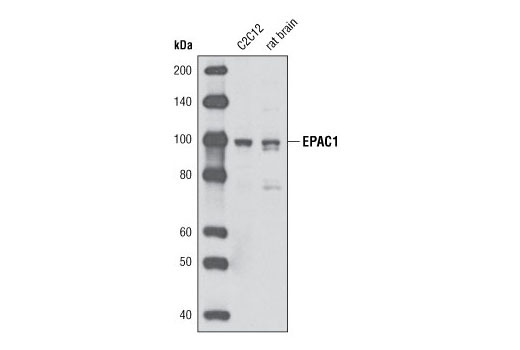 EPAC signaling plays a significant role in a number of cellular processes including migration and focal adhesion formation (2), exocytosis (3), insulin signaling (4), axon growth and guidance (5) and neurotransmitter release (6). Background: The ezrin, radixin, and moesin (ERM) proteins function as linkers between the plasma membrane and the actin cytoskeleton and are involved in cell adhesion, membrane ruffling, and microvilli formation (1). 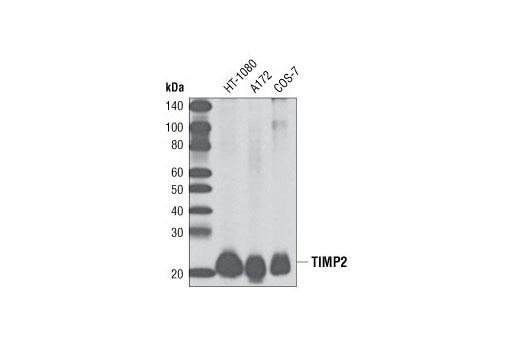 ERM proteins undergo intra or intermolecular interaction between their amino- and carboxy-terminal domains, existing as inactive cytosolic monomers or dimers (2). 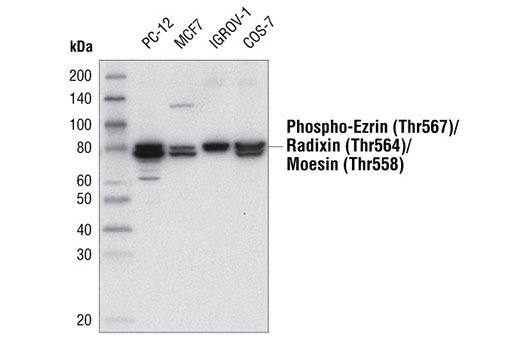 Phosphorylation at a carboxy-terminal threonine residue (Thr567 of ezrin, Thr564 of radixin, Thr558 of moesin) disrupts the amino- and carboxy-terminal association and may play a key role in regulating ERM protein conformation and function (3,4). Phosphorylation at Thr567 of ezrin is required for cytoskeletal rearrangements and oncogene-induced transformation (5). 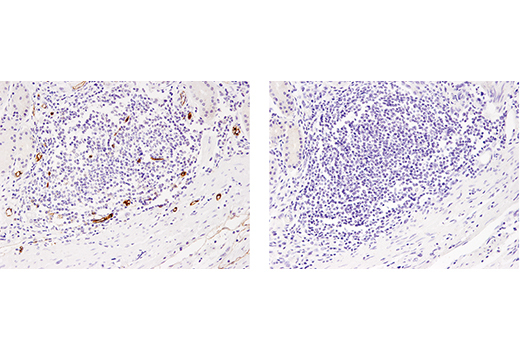 Ezrin is also phosphorylated at tyrosine residues upon growth factor stimulation. 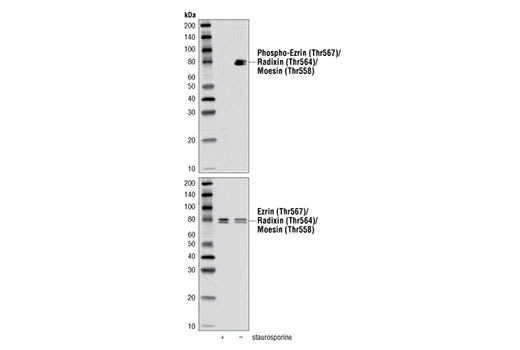 Phosphorylation of Tyr353 of ezrin transmits a survival signal during epithelial differentiation (6). Background: At least five distinct polo-like kinases exist in mammalian cells: PLK1, PLK2, PLK3, PLK4/SAK, and the non-catalytic PLK5 protein (1). The p53-induced PLK2 functions in centriole duplication, as well as at spindle and S phase checkpoints (3-5). 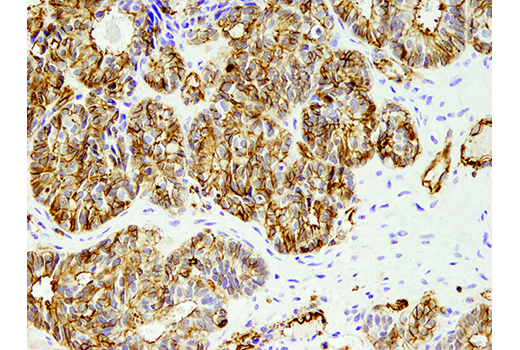 Research studies show that PLK2 expression is related to chemosensitivity in ovarian cancer. 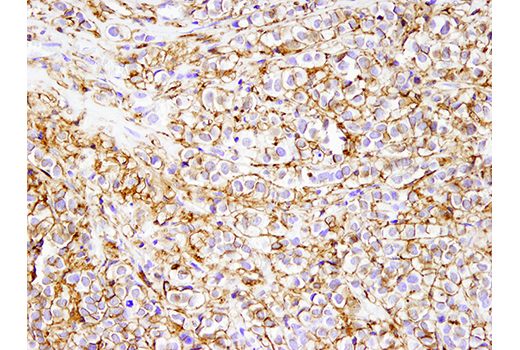 Downregulation of PLK2 expression in chemosensitive ovarian cancer cells is associated with a greater chance of relapse in patients following specific treatment regimens (6). 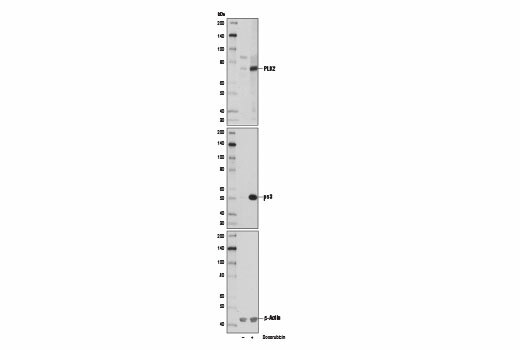 PLK2 can phosphorylate α-synuclein at Ser129, which is a site shown to be involved in diseases of the central nervous system (7,8). 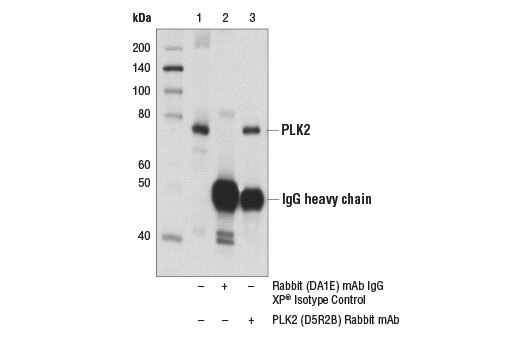 Polo-like kinase 2 also phosphorylates GEFs and GAPs, regulating Ras and Rap small GTPase function in neurons (9).